I don’t think the people of the U,K. are ignorant. The question was straight forward. The whole (Soft-Hard Brexit) talk didn’t start until after the election was over. Even Theresa May (A Remainer) has been running around for over years now saying “Brexit means Brexit”. People knew what they were voting for, and people on the other side have been trying to nullify the results in every conceivable way since it happened. What would you think you would be voting for? And if the country voted leave NATO and the other side started talking about a soft or hard leave from NATO we would think they were on drugs at best at worst trying to overturn the democratic vote. The comparison between Brexit and NATO is totally ridiculous. They’re completely different. Do you really not understand that. Obviously there different, I am talking about the wording of the question. Some people on the remain side are trying to make it look like the leave side didn’t know what they were voting for. I am just saying that is silly. As Theresa May said “Brexit Means Brexit”. I am assuming she is a smart lady, and understands what the people voted for. What does “Brexit means Brexit” mean? Obviously people thought they were voting to leave the EU in a clean break. Why would they want to stay in the EU is a better question? The only popular politicians in the E.U. are right wing populists. Italy’s Salvani is the most beloved politician in the EU whereas Merkel stepped down and Macron is rocking a 20% approval. This has been a slow sinking ship wreck ever since the Grexit debacle. And Western Europe, Central Europe, and Eastern Europe have about as much in common as California and Mississippi. Well actually less in common since California and Mississippi speak the same language. ’‘Merkel stepped down’’: Merkel’s party is still solidly in power. ’‘This has been a slow sinking ship wreck ever since the Grexit debacle’’: More Fox News and talk radio nonsense. It’s not a gross overstatement it’s what we used to call facts. Compare Salvani, Orban, Hoffer, Milos Zemen, andrzej duda or even anti immigration candidates like Sebastian Kurtz approval rating to any of the leaders in Western Europe. Merkel has been pressured to leave by her own party these are not my words. Since the 2015 migrant crisis her party has fell to historic lows of 29%. 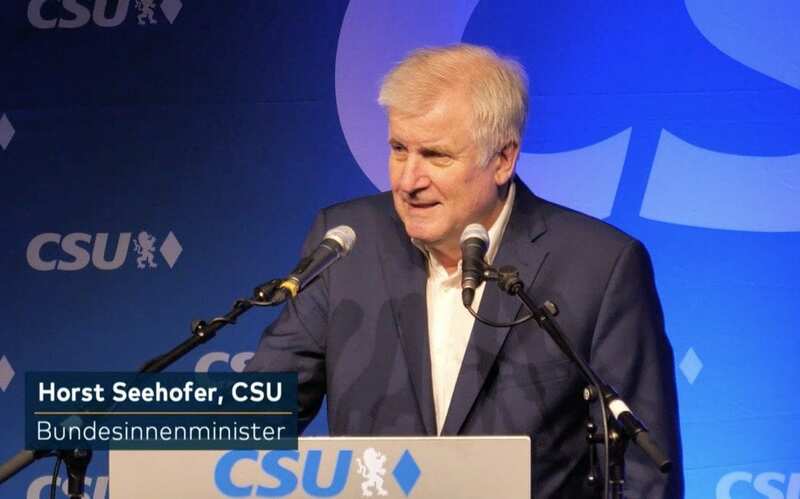 The center left has been completely pushed out of most European countries and the second leading party now in Germany is the AFD, basically the Naz’is, which came about after her decision to take in migrants accounting for 2% of the population into Germany. In Europe right now being pro migration is a toxic position, this is not and overstatement. All the leaders in Western Europe are trying to scramble away from those positions in order to keep their jobs. This is all another issue and really has nothing to do with Brexit. It is all intertwined, without Merkel’s migrant policy in 2015 the remain side probably would have won. That’s really debatable. Germany’s migrant policy really came to a head after Brexit and really wasn’t an issue anyway. It’s definitely been an issue with politicians as they have been distancing themselves from Merkel’s immigration policy, as well as globalism in Europe. I highly suggest this article by the BBC, which shows the correlation with the migrant crisis and globalism with the surge of nationalism and populism. A good read from a good source. The AFD party in Germany which polls second was founded in 2017. Think about the discontent that would allow a party that was one year old to go to second place. Then there is Italy which the leading party was founded by a comedian and the most popular politician is far right. Politics in Europe are shifting fast. 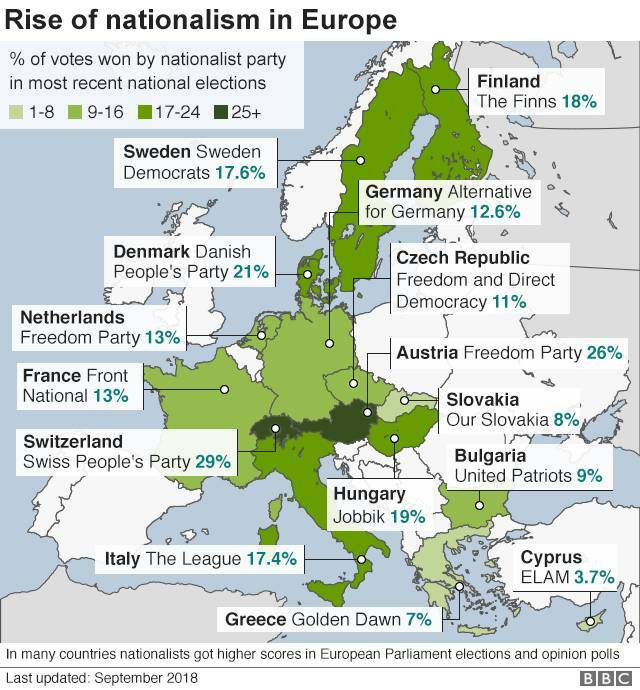 As nationalist and far-right parties make gains across Europe, a country-by-country guide. I follow the BBC daily, immigrant policy is a part of Brexit, but not Germany’s immigrant policy. Brexit is a lot about a bunch of old brits that don’t want to called Europeans and don’t want to admit their #2 to Germany. they want a do-over because leavers can’t negotiate a deal and leaving without a deal will completely destroy the British economy. Yep… somehow when faces with the cold truth that they were lied to and the EU isn’t going to let England have the benefits without actually being in the Union… well… it tends to change one’s mind. Just leave and tell the EU your new trade policy with them. they have no leverage in talks. They want a Norway like agreement but the EU isn’t going to give it to them, they straight up refuse to re-open negotiation with the UK making May stuck with un-passable bill. What if they have a do over and leave wins again?